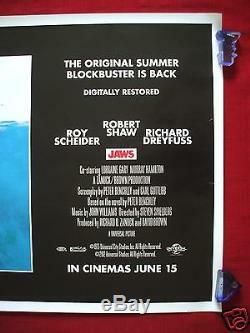 UP FOR SALE IS A GENUINE 2012 ORIGINAL DOUBLE SIDED RE-RELEASE ADVANCE U. QUAD FOR STEVEN SPIELBERG'S 1975 CLASSIC JAWS. THE ORIGINAL 2012 AUTHENTIC DOUBLE SIDED U. IT MEASURES A FULL 30x40 INCHES AND IS IN C8-C9 EXCELLENT TO NEAR MINT UNUSED CONDITION - A VERY HARD TO FIND ORIGINAL. SPECIAL RARE 2012 RE-RELEASE QUAD VERSION FOR UNIVERSAL STUDIOS 100TH. PLEASE REVIEW ALL PICTURES - HAND SELECTED , THE FINEST EXAMPLES - INVESTMENT GRADE. A BEAUTIFUL EXAMPLE OF THIS TITLE THAT IS HARD TO FIND. READY FOR HOME THEATER DISPLAY. WE ARE ABSOLUTELY CERTAIN IT IS AUTHENTIC. BE ASSURED THAT ITEMS WILL BE PROPERLY PACKAGED WITH EXTREME CARE. SHUTTERISLAND ORIGINAL VINTAGE MOVIE POSTERS. 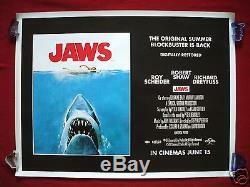 The item "JAWS 2012 ORIGINAL MOVIE POSTER UK QUAD D/S SPIELBERG 1975 CLASSIC HALLOWEEN" is in sale since Wednesday, June 3, 2015. 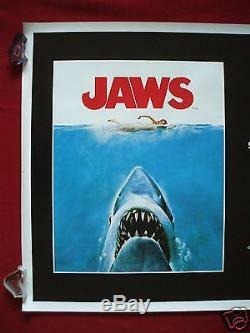 This item is in the category "Entertainment Memorabilia\Movie Memorabilia\Posters\Originals-International\2000-Now". The seller is "shutterislandovmp" and is located in Minneapolis, Minnesota.